Whether you are moving into a larger office, moving your office to a new location, or your office has consolidated with another business and you need to close one of the offices cleaning out the office you no longer need can be somewhat overwhelming between packing up all of the files, moving the good furniture and office equipment to the new location and setting up the new office. You may feel that you don't have either the time or the energy to clean out that old office space. Luckily, you don't have to you can hire our services here at Flat Rate Junk Removal. 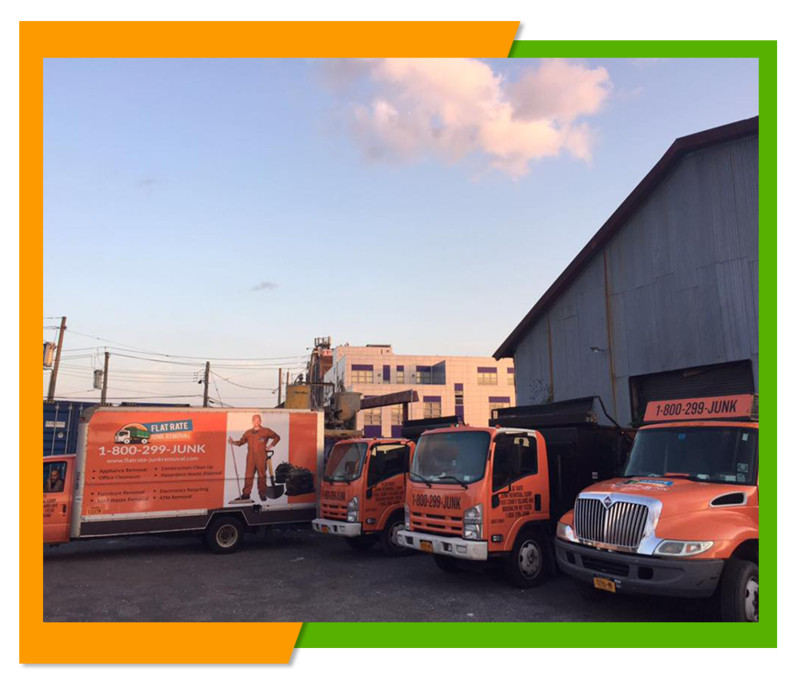 With our large 24 cubic foot trucks and our experienced two man crews we can take care of all of your office cleanout needs. 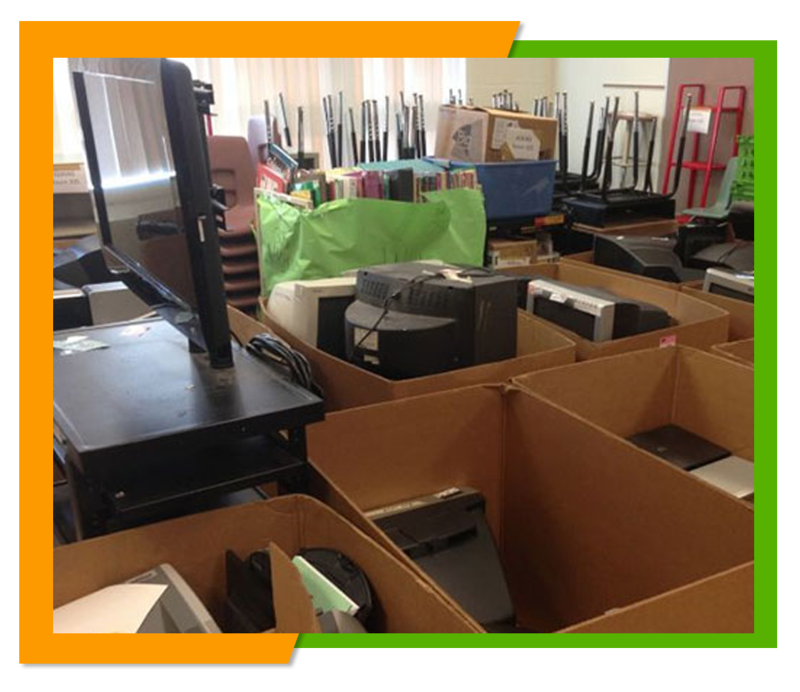 Once the last of your good equipment is loaded onto the truck to be moved to your new office, just give us a call and arrange a date and time that is convenient for you to have us come to your old office and remove all the old furniture, equipment, and debris and take it away. In addition we clean up the space to ensure that office is clean and waiting for the next tenant. You won't have to lift a finger, we'll take of everything ourselves. Just because you no longer have any use for those old desks or computers doesn't mean that they no longer have a useful life. Here at Flat Rate Junk Removal we will recycle any still useful furniture and equipment for you at no extra charge. We firmly believe that recycling still useful items serves a number of purposes. This furniture helps people starting a business on a shoe string get much needed office furniture and equipment, it reduces the amount of junk going into a landfill by deferring that still good furniture from being junked which is better for the environment and for our community. Unlike many other junk removal companies we won't charge you extra for those recyclable items. We will take care of any additional expenses ourselves while you play one flat fee. We do mixed loads so we can load up all that office junk including furniture, equipment, papers and extra boxes all in one load making that cleanout quick and efficient so you can get on with continuing your business at your new location. Most of our customers want to know the cost of our services before they hire us, which is why we offer our customers a free estimate at your request. Once we give you an estimate you won't be surprised by any unplanned or unexpected additions to your bill. Unless you add additional junk to be removed after the estimate what we quote you is what you will pay. To schedule a free estimation or an office cleanout give us a call at 1-800-299-5865 and let us know how we can be of assistance to you.